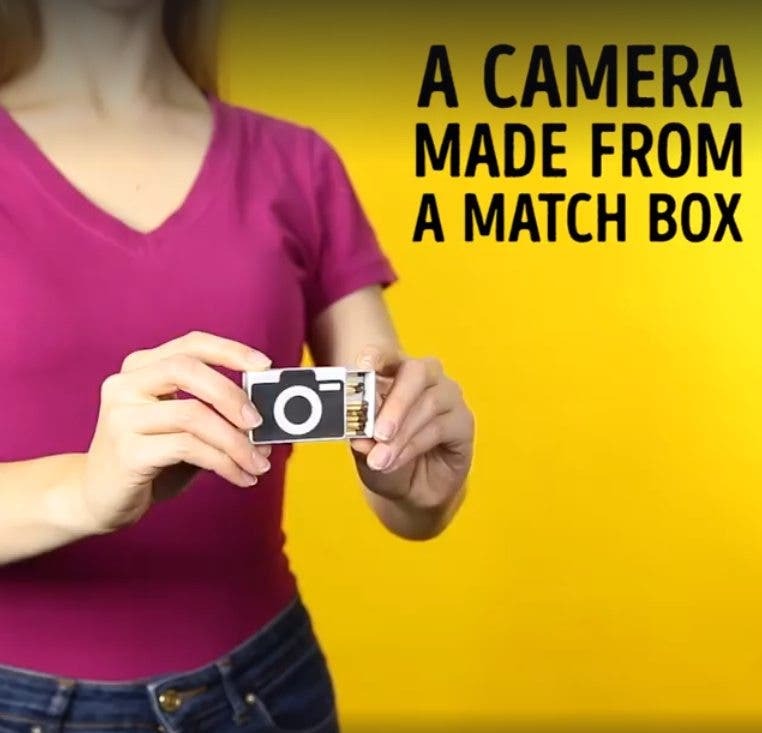 This DIY Matchbox Pinhole Camera Is So Fun. Try it Out! Pinhole photography is perhaps the most basic yet creative genre to explore on the cheap, while being super enjoyable at the same time. We found this tutorial video by Brightside on how to construct a working pinhole camera using a matchbox as the camera body. For this simple project, you will need a standard matchbox which has just the right size to house a 35mm standard film, a fresh roll of 35mm film, an empty roll of 35mm film, thin cardboard (the box of the new film can be used), black PVC electrical tape, a silver tape, scissors, a sharp craft knife, a needle or a pin, and a black marker pen. To construct the main body from the matchbox, cut out a 36mm x 24mm (film size) rectangular hole right in the center of the matchbox tray. Then color the inside of the tray with black marker pen to reduce internal reflections in the box. Next, cut out a 6mm square hole in the center front of the matchbox sleeve. To create the pinhole, cut out a small piece of silver tape and place it onto a thick piece of cardboard and seal the edges with black tape. Poke a needle or sharp pin into the center of silver tape to create a very small hole. To load the film, pull out a little film and thread the film through the matchbox, making sure the emulsion side (non shiny side) is facing the pinhole. Using some clear sticky tape, splice the ends of the film together as neatly as possible. Try to make sure the edges are lined up together so the film can pass easily into the empty canister. To add a shutter, cut out a thin rectanglular card to be used as a slider that opens and shuts the pinhole manually. The thin card should be painted or taped black to minimize light leaks. Having the shutter, now you have a fully functional, matchbox-made pinhole camera that can take actual exposures on film and create interesting pinhole photography. Photography is art and art is a lot more than just a megapixel race and high ISO wars, so having a DIY, fun to make, and use pinhole camera may just be the perfect escape we all need in today’s digital photography world.